One of the best highlights from my recent trip to Alberta was during my last day, as I headed to Yamnuska Wolfdog Sanctuary for an interactive tour thanks to North Collective. Of course, if you know me, you are aware of my huge passion for animals and obviously photography, so this was a real treat. Especially the fact that I have been following their social media channels for quite sometime now, it's great to finally meet these guys in real. Yamnuska Wolfdog Sanctuary is a non-profit organization based in Cochrane Alberta who gives a second home for these beautiful animals, Wolfdogs. Not only is it one of the biggest sanctuaries in Canada, but it is also recognized for educational tours and successful adoption programs to help give some of the dogs a second chance with a family. The interactive tour is one of the main highlights of the sanctuary, as they take you in to some of the enclosures to meet the dogs up close, as a guide hands you some yummy treats to feed them explaining the history of the sanctuary, but also to learn more about the species. Being the last group of the day(and only being three), we were lucky to have an even more close-up interaction with the dogs and made the tour even more special. So you are probably wondering what exactly is a wolfdog, and why do they exist, right? Wolfdogs are basically a mixed breed between a wolf and a dog. There are different kinds of wolfdogs, depending on how much '' wolf content'' each dog can have. A high content wolfdog has more wolf than dog, and a low content wolfdog has more dog than wolf. It doesn't mean that a low content wolfdog will be your average pet dog in an apartment either. These dogs need special care, and need an active home to be able to live life to the fullest. Sadly, wolfdog breeders seem to care a bit more about the money then the actual dogs and don't take the time to educate their clients on how to take care of this type of breed. People purchase them because they look cool and realize after that they can be very difficult animals to train and keep. That results in abandonment and one of the reasons why this sanctuary exists. I learned that there is at least one wolfdog breeder in each province, but also Yamnuska is the only wolfdog Sanctuary in Canada. When owners get too discouraged about their wolfdog it can result to a call at animal services and sadly the animals are usually put down right away because there is not much information about the breed and they can be very difficult to adopt and train. Luckily Yamnuska is a safe place where wolfdogs are given a second chance. With educational services, the sanctuary also has an adoption program where you can adopt your own dog. With the right education, people can come to the sanctuary and bring home a new member of the family.
'' 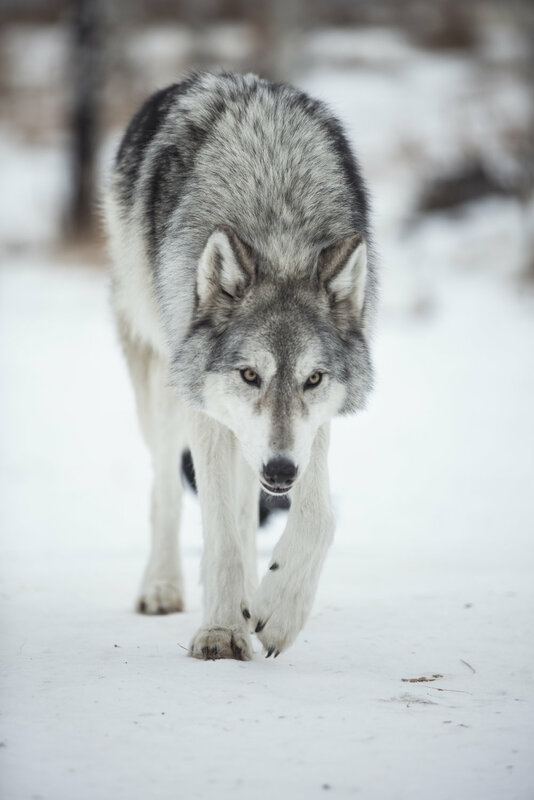 We want to encourage fellow passionate wolfdog lovers to take action for responsible wolfdog ownership, wild wolf protection, and other causes we’re passionate about as an establishment in Alberta’s community. '' Yamnuska Wolfdog Sanctuary. We started off in the High content wolfdog enclosure where we met three charming dogs (see in photos above). We were handed some treats and watched them run around playfully as we listened and educated ourselves about the breed. It was such a cool experience to witness wolf like dogs so close, but also to uncover a lot of myths behind wolves and why humans became so terrified about the species. We then moved to the Low content wolfdogs, as we walked into the enclosure we noticed a sudden change as the dogs ran towards us all excited to be pet, and be given some treats. Kind of like your average dog that loves attention. Although these dogs are considered low content wolfdogs, they prefer to live outside rather than inside. They are a lot friendlier and you notice a lot more dog characteristics, but you can still see the wolf in them. It was really interesting to see the difference between the high content and low content dogs. It makes you appreciate more about the species, but also allows you to understand on how they need to be taken care of and why they aren't your average home pet.